Last week (29 March – 1 April) the CCD hosted a group of students as part of its annual High School Work Experience program. The program is suitable for students in years 10, 11 and 12, and provides students with the opportunity to be immersed in a range of research training activities, allowing them to experience first-hand some aspects of a research career. The first group for 2016 comprised six Year 10 students from TARA Anglican School for Girls. – observation of research projects, including experiments on letter-position priming and prospective memory. 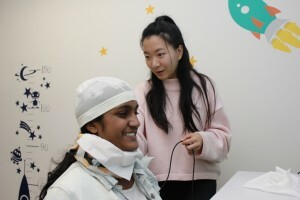 – learning about the magnetoencephalography (MEG) brain imaging technique, used by CCD researchers to understand the time course of neural processing. Some students even had the opportunity to lie in the MEG scanner and experience what it would be like for a participant in MEG research! – hearing from researchers from a variety of fields including belief formation, memory, perception and action, and reading, as well as from research support staff members in research administration, finance, student administration and IT support about their work. Feedback from the high school students was overwhelmingly positive, with students enjoying the opportunity to learn more about what can be involved in a career in research. The CCD work experience program has been extremely popular with very limited spaces remaining for only one of two additional groups to be hosted later this year. More information about the program is available on the CCD website.